When coaching a player for a first time, they will often ask me to teach them new serves. They want serves which will bamboozle their opponents and win them lots of cheap points. But before I reveal my serving secrets, I ask them to show me their existing serves. And you know what? In most cases, the player already has a couple of decent serves, but they use them in a very predictable way. So before teaching any news serves, I always try to improve the serves they already use. Service height – Try to keep your serve as low over the net as possible. The lower the ball travels over the net, the harder it is to attack. To keep the serve low, make sure you contact the ball around net height. If your contact point is too high, the serve will bounce higher. Take a look at this video from PingSkills which shows a neat way to practice keeping your serve low over the net. Service length – Practice serving at different lengths, in particular half-long and long. For half-long serves, the second bounce of the service on the opponent’s half of the table (if given the chance), would land very close to the end line. Half-long serves are effective because they are not easy to attack strongly and difficult to return short, giving plenty of opportunities for a third ball attack. 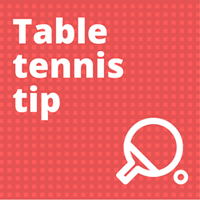 For long serves, the first bounce on the opponent’s half of the table should be close to the end line. At local league level, you can win a lot of points with long serves, as players struggle to return the ball low over the net, again giving you plenty of opportunities for a third ball attack. For more read my blog post in praise of the long serve. Service placement – Practice serving to different positions on the table, in particular forehand corner, backhand corner and the opponent’s elbow. Aiming for the elbow can be very effective, especially if your opponent doesn’t have great footwork, as it’s the crossover point between forehand and backhand. If you aim for the elbow, you are forcing your opponent to make a decision. Do they play with their forehand? Or do they play with their backhand? If they are indecisive and do not move, they will end up playing a very awkward stroke, making an error or giving you an easy ball to attack. Spin variation – Practice heavy spin and no spin serves. To get more spin you need a relaxed wrist and more of a whipping motion, brushing the ball with plenty of bat acceleration. For a no-spin serve, try to keep the service action very similar (probably a little less acceleration), but contact the ball nearer the handle, which is the slowest moving part of the bat. If disguised, a no spin serve can really catch an opponent out. If they play a no spin serve as though it is heavy spin, they will often make an error or give you an easy ball to attack. If you work on these areas, you can transform an existing serve and the need to learn new serves doesn’t seem quite so urgent. You have gone from one serve (e.g. side-spin, cross court) to multiple variations of one serve (e.g. side-spin or no spin; half-long or long; forehand corner, backhand corner or elbow). That’s a lot of different options! This helps massively in a match, as it’s much harder for your opponent to get used to your serve. You’ll often find that different opponents will struggle against different variations. One opponent may find the long serve to their backhand easy to deal with, but struggle with half-long to their elbow. The next opponent may find half-long to their elbow easy to deal with but struggle with long to their backhand. Your job is to find out which variation is going to be be effective against which opponent. If you only have one variation of the serve, and the opponent returns it easily, you’re a bit stuck and you may stop using the serve. But if you mix-up the length, placement and spin, there is more chance of finding a variation of the serve which gives your opponent difficulty. And maybe you’ll decide you don’t need to develop a new serve after all! Anton Kallberg – future world champion?